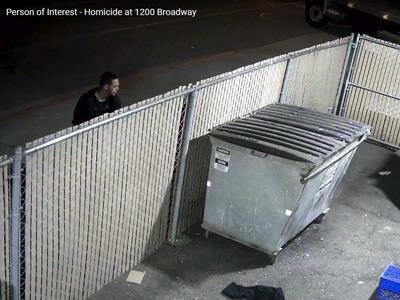 Everett - Everett detectives ask the public to help identify and locate a person of interest in a recent homicide. Just after midnight on May 24th, officers responded to the 1200 block of Broadway Ave on the report of two males fighting. Arriving officers found a male lying near a bus stop located on the east side of the street. The male, who was bleeding severely from his head, was later identified as 62 year-old Jay Agostinelli. He was a local homeless male known to camp in the Everett and Marysville area. During the assault Agostinelli sustained multiple skull fractures; a weapon was believed to have been used. Mr. Agostinelli was taken to a local hospital, but died as a result of the injuries he sustained. Officers contacted several nearby witnesses who watched the assault and they provided a description of a male seen fleeing northbound after the attack. That same male was seen running eastbound on 12th St. The male below is believed to be the male who ran from the scene and is a person of interest in this case. Anyone with information about this incident or can identify this person of interest is asked to call the Everett Police Department TIP LINE at (425) 257-8450 or Crime Stoppers of Puget Sound at 1-800-222-TIPS.